This project was created on 01/21/2016 and last updated 4 months ago. 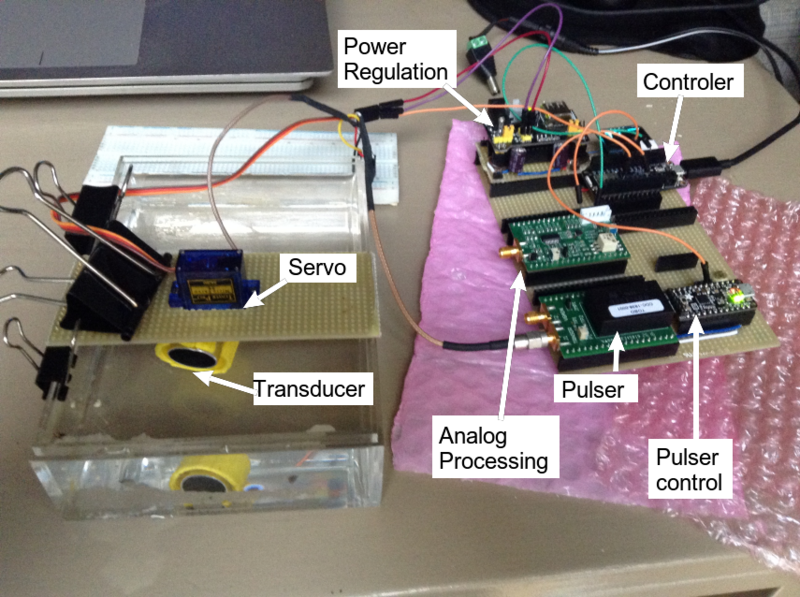 Developing an open-source, low-cost technological DIY kit to allow scientists, academics, hackers, makers or OSH fans to hack their way to ultrasound imaging. This project, Murgen, has a specific target of providing a technological kit to allow scientists, academics, hackers, makers or OSHW fans to hack their way to ultrasound imaging - below 500$ - at home, with no specific equipment required. Today, we have achieved the electronic design of the kit and are having it made by a PCB assembly, we have physically tested it with our in house transducer and we&apos;re getting images! I&apos;m setting as well a repo for a modular version of Murgen. In smallish (but better quality here), I&apos;ve done the tests on cheap (2$) piezos without backing, for which I didn&apos;t know the frequency. The central frequency was around 1.9MHz, and the shield was enough to do some FFT&apos;ing ! I&apos;m quite tired of not having 10Msps+ ADCs as simple, easy to use Raspberry Pi pHAT. That&apos;s why I&apos;m doing one - will be helpful to have one ready to work for my Pi Zeros! I wanted to have a small board to connect the different modules.. and make room for two Raspberry headers (one for a raspberry, the other for a cape... say a 20Msps ADC =) ) - especially now that I have this wonderful pi W to play with! It&apos;s fascinating to see how these resources map the history and evolution of the probes! Attached below is the graph of these predicates.. leading ultimately to the state-of-the-art Clarius probe. Yeah! After some time, glad to have the module on Tindie at https://www.tindie.com/products/kelu124/ultrasound-imaging-analog-processing-module/ . That&apos;s the same one as the logs below, useful to have fun with ultrasound signals. What does the analog processing unit do ? Make/order a pulser module, as well as a analog processing module. Make files are on github. In the meanwhile, prepare the motherboard, with a simple stripboard, using the tracks convention. Alternatively, use a Beaglebone PRUDAQ to acquire the raw signal. Hey! Interesting project, we usually work on that type of project. May I have one of that kit for practical testing. I&apos;m at the University of Utah, my area of study is Mechanical Engineering. For my senior project I am tasked to build a Low Cost Ultrasound Probe that connects to android. Our budget is about $500-1000. Its purpose is to be able to sea a needle through skin and apply local anesthetic. I believe our best best is following this dev kit. Will you help guide my team and I; as I&apos;m sure we will have many questions? Hi, I just received one of these ADCs. I was hoping to test it just using a signal generator to capture the wave forms... any suggestions for how to set up a quick experiment? Any sample / test code would be a great help! Hey @jblackwood - you may want to have a look at any microcontroller with DACs. I had used one to mimic so to speak ultrasound signals, information and code is there: https://github.com/kelu124/echomods/tree/master/silent . I love this. So after spending almost half this year in hospital, having a chronic disease and needing the expert vein pokers with ultrasound (if they have a sec) as UV near IR doesn&apos;t work. I have extensive pi/chip,espX, etc experience and am thinking of making a 3d arm mapping a 3d space around the arm with realsense or something else that&apos;s USB, combining ROS and then for imaging ultrasound. That brings me to your project. How deep can you go for veins etc? I&apos;d like to automate the finding of veins (mapping) with AI/tensorflow for the 3d mapping and then ROS for the poking (with human input). I like your testing method too and need to figure out how to make my own vein like version. Tthanks! It&apos;s more of a dev kit for now, with (very) little to bring to the medical side, but I know some people who may need your help! Oh, and you even are using a BitScope - the one I have! Frédéric Patat ? Noté :) c&apos;est bien toi aussi robert delabitenebois ^^? I&apos;m getting ready to hit send on your HackaDay write up. I wanted to offer some help/expertise, and even a free bit of kit, if I can find the gear. I used to teach a couple of ultrasound techniques, and wound up building my own ultrasound phantoms (with incredible success). I wrote about it a bit on my blog: http://medicforlife.blogspot.com/2012/11/ultrasound-phantoms-war-were-declared.html. If you&apos;re reasonably local (I have no idea what the shipping is to where you&apos;re working on this), I&apos;ll send you some of the extras, or I can even look at building you a phantom and shipping it, if you&apos;re close enough. Thanks for doing this! If I had an ultrasound in the field... Well, a lot of pain could be saved, an incredible amount of assurance could be had, and the capability that we could bring to austere environments would dramatically increase. The purpose of this project is to teach myself myHDL and creating some useful cores in the process. What's all this myHDL stuff, anyhow? You are about to report the project "Murgen: open source ultrasound imaging", please tell us the reason.